Charlie Brown, Snoopy and the rest of the Peanuts gang are looking forward to their all-new CGI motion picture THE PEANUTS MOVIE. ©20th Century Fox / Peanuts Worldwide LLC. Perennial underdog Charlie Brown becomes shyly smitten with his new neighbor, a pretty red-haired classmate who leaves him awkwardly tongue-tied. Every effort he makes to impress her—learning tricks for a magic show, taking dance lessons from his beagle Snoopy, writing a book report assignment for both of them while she is away—is thwarted in classic Charlie Brown style. Meanwhile, inspired by his owner’s romantic quest, Snoopy writes a wartime adventure drama in which he pursues his nemesis, the Red Baron, while courting a beautiful aviatrix named Fifi, using a typewriter he has found in a Dumpster. He is both assisted and distracted by his winged friend Woodstock, and the bird’s gaggle of identical mischievous friends. Their wordless interactions will charm younger audiences. The 3D animation from Blue Sky Studios, the same studio that made the “Ice Age” films, gives the Peanuts gang—Charlie Brown, Linus, Lucy, Peppermint Patty, Marci, Schroeder, Snoopy, Woodstock and the others— another dimension, literally and figuratively. The snow looks cool. The suburban hilly backgrounds are sensational. Perhaps the most effective uses of the 3D technology are the aerial scenes with Snoopy, Fifi and the Red Baron that appear throughout the film, culminating in an action-packed showdown in which the camera loops, dips and swerves along the sky with Snoopy’s doghouse/airplane. Story-wise, Charlie Brown’s attempts to woo “the little red-haired girl” are the most compelling and effective aspect of the film. Though consistently failing every time he tries to talk to her, he never gives up. 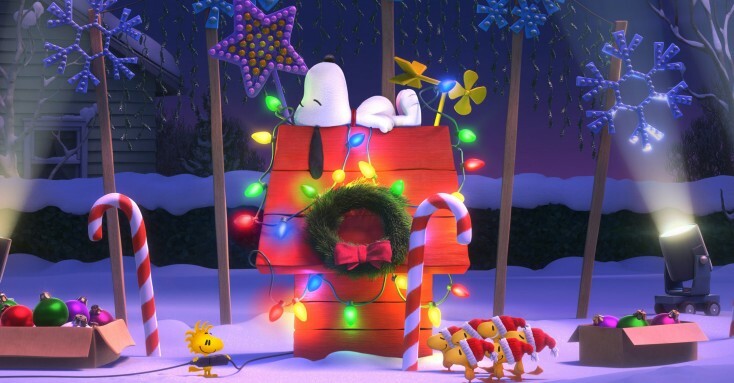 An especially fun scene is where Snoopy teaches his master to dance so he might have a chance to get close to the girl at an upcoming school dance. The familiar Vince Guaraldi music from the various TV specials pops up throughout the film, including the “Linus and Lucy” theme. 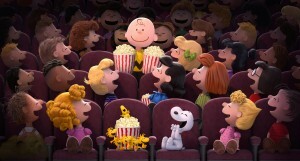 Those familiar with the “Peanuts” ouvre will spot many gags from the TV shows and the longrunning comic strip throughout. “The Peanuts Movie” isn’t just a greatest hits of Peanuts favorites, though. It is completely modern while retaining a sense of timelessness that has endeared generations to this franchise. (No cell phones or computers are evident in the Peanuts world.) One contemporary scene shows Sally, Charlie Brown’s little sister, taking advantage of big brother’s sudden popularity after he scores a perfect grade on a standardized test at school by marketing merchandise and leading fans on a tour of their home. The film also delivers positive moral lessons in selflessness, honesty and kindness. Christophe Beck delivers a solid and appropriate score and the film contains two new songs: “That’s What I Like Best,” sung by Flo Rida and Michael “Fitz” Fitzpatrick, and “Better When I’m Dancin’” sung by Meghan Trainor, who co-wrote the song with Thaddeus Dixon. Audiences will want to stay through the closing credits to see a bonus scene.